If you are an elementary school teacher, you will need to make up 2nd grade lesson plans for forming possessives. There are arrays of lesson plans available for you to use as a model for your 2nd grade lesson plans for forming possessives that are easy to follow. One of the things that you should do is to think about the particular lesson that you want your students to learn. Before writing your lesson plans for forming possessives, ask yourself "what do I want my students to take away from the class?" After assessing the learning objective for your students then you can begin to write down a few learning goals. Remember, it is crucial that you set learning objectives and learning goals in your lesson plans for your students. Without this, your work may be in vain. Now it is time for you to come up with what you want to teach your students. If the subject is possessives or possessive nouns, what is it about possessive nouns that you are trying to convey? You should be sure to ask yourself these questions just to get off on the right foot regarding your lesson plan. Below you will find a couple of lesson plans catered towards second graders who are learning about how to form possessives. You can use the lesson plans as samples or as templates for what you are trying to do. Attention getter: Hold up the ball that says "Jennifer's toy." Ask "Who's toy is this?" The class will answer "Jennifer's." Discuss how the apostrophe is like a comma in the air, or a hook that will drop down and take ownership of a noun or pronouns. Talk about how ownership means "to possess." Hand out Bingo cards that have possessive nouns and pronouns on them. Have fifteen minute intervals of the Bingo game. Each time there is a Bingo winner be sure to reward the students. Collect the Bingo cards and reward the class for their effort. Teacher will draw Hangman items on the board, students will need to guess the particular possessive word. All possessive words will be taken from the list of possessive vocabulary words that have been previously studied in class. Students will be broken up into two teams where they will take turns guessing at which possessive vocabulary word is being used in the Hangman game. Winning team will win free time during class or some other reward. Use stickers to place on index cards. Write names of students on the index cards using the crayons. Give students crayons. They will be asked to use any personal pronoun possessives that are applicable to the sticker in a sentence. For example students should identify personal possessive pronouns like my, her, his, your, their and its. Give students a specified time in order to write their sentences. Once you call "time" students should put their crayons down. In random order teacher can read the index cards. These are just two examples of lesson plans. You can definitely use either of the examples as a template for when you put together your own lesson plan. Additionally, if you find that these lesson plans do not include what you are looking for, you can feel free to look online. There are a plethora of lesson plans on the Internet. You can easily use them as a template and tailor them to your needs. "2nd Grade Lesson Plans for Forming Possessives." YourDictionary, n.d. Web. 24 April 2019. 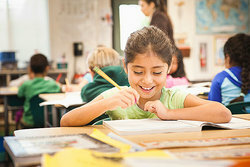 <https://education.yourdictionary.com/for-teachers/2nd-grade-lesson-plans-for-forming-possessives.html>.